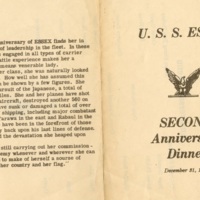 This pamphlet contains various statistics of the USS Essex while it was in service during World War Two. 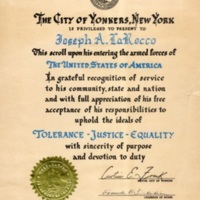 This was given to Joseph La Rocco for his service aboard the USS Essex. 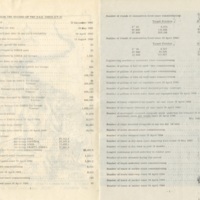 The dinner was held on December 31, 1944. The U.S.S. Essex's action up onto that date is described. Joseph LaRocco was a sailor aboard the USS Essex for eighteen months. 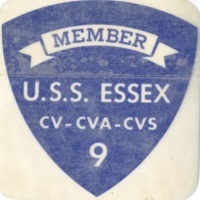 The USS Essex was the flagship of the 3rd Fleet with Admiral Haulsey. LaRocco participated in seven major sea battles and nine invasions.